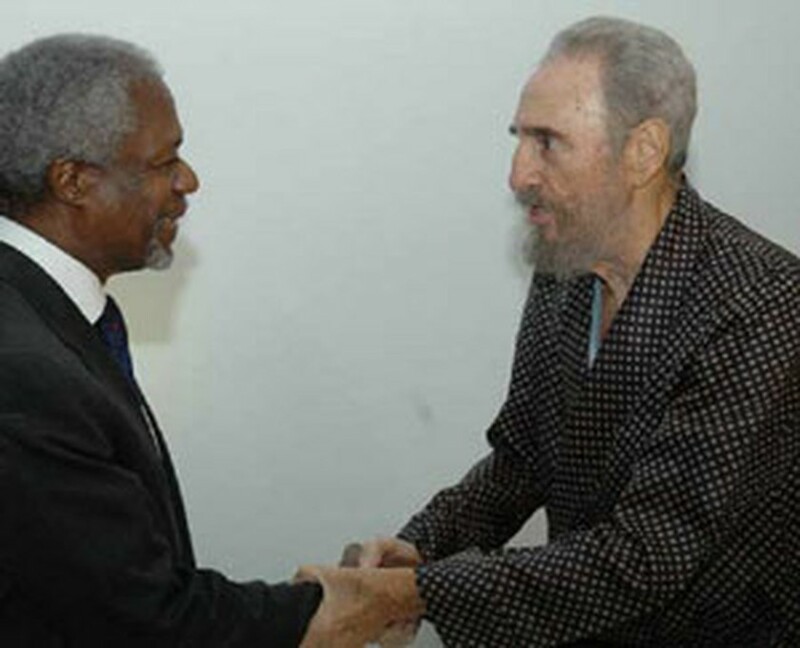 Ailing Cuban President Fidel Castro and UN Secretary General Kofi Annan have met in the Cuban leader's hospital room, the Juventud Rebelde daily said Friday, publishing a photograph of the meeting. President Castro, wearing a dressing gown, is seen shaking Mr. Annan's hand in the picture taken late Thursday, soon after the UN chief arrived in Havana for the September 11-17 Non-Aligned Movement meeting. "During the friendly meeting, the Cuban president and the top UN representative exchanged opinions on the relevance of the Non-Aligned Summit and other major international issues such as the Middle East situation and current events in Africa," Juventud Rebelde said. Mr.Annan was in Havana for a meeting of the 118-state NAM and was scheduled to address NAM leaders on Friday, when the summit of heads and state and government gets under way after four days of lower-level meetings. During their one-hour meeting, President Castro gave the UN chief an autographed Cuban edition of the book "100 Hours with Fidel," by French-Spanish author Ignacio Ramonet, the newspaper reported. A summit of 18 developing countries (G15) was being held in the Cuban capital in parallel with the September 11-17 NAM meeting.